Palestinian photos and films seized by Israeli troops have been gathering dust in the army and Defense Ministry archives until Dr. Rona Sela, a curator and art historian, exposed them. The material presents an alternative to the Zionist history that denied the Palestinians’ existence here, she says. Of all places, these three reels of 16-mm film are housed in the central archive that documents Israel’s military-security activities. It’s situated in Tel Hashomer, near the army’s National Induction Center, outside Tel Aviv. The three items are barely a drop in an ocean of some 38,000 films, 2.7 million photographs, 96,000 audio recordings and 46,000 maps and aerial photos that have been gathered into the IDF Archive since 1948, by order of Israel’s first prime minister and defense minister, David Ben-Gurion. However, a closer perusal shows that this particular “drop in the ocean” is subversive, exceptional and highly significant. The footage in question is part of a collection – whose exact size and full details remain unknown – of “war booty films” seized by the IDF from Palestinian archives in raids over the years, though primarily in the 1982 Lebanon War. Recently, however, following a persistent, protracted legal battle, the films confiscated in Lebanon, which had been gathering dust for decades – instead of being screened in cinematheques or other venues in Israel – have been rescued from oblivion, along with numerous still photos. The individual responsible for this development is Dr. Rona Sela, a curator and researcher of visual history at Tel Aviv University. 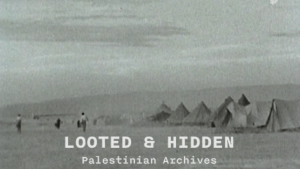 Now Sela has made her first film, “Looted and Hidden: Palestinian Archives in Israel,” an English-language documentary that surveys the fate of Palestinian photographs and films that were “captured” and deposited in Israeli archives. It includes heretofore unseen segments from films seized by the IDF from Palestinian archives in Beirut. These documentary records, Sela says, “were erased from consciousness and history” for decades. Getting access to the films was not easy, Sela explains. Her archival journey began in 1998, when she was researching Zionist propaganda films and photos that sought to portray the “new Jew” – muscular, proudly tilling the soil – in contradistinction, according to the Zionist perception, to the supposedly degenerate and loutish Palestinian Arab. “After spending a few years in the Central Zionist Archive in Jerusalem and in other Zionist archives, researching the history of Zionist photography and the construction of a visual propaganda apparatus supporting the Zionist idea, I started to look for Palestinian visual representation as well, in order to learn about the Palestinian narrative and trace its origins and influence,” she says. That task was far more complicated than anyone could have imagined. In some of the Zionist films and photos, Sela was able to discern, often incidentally, episodes from Palestinian history that had “infiltrated” them, as she puts it. For example, in Carmel Newsreels (weekly news footage screened at local cinemas) from 1951, showing the settlement of Jews in Jaffa, demolished and abandoned Arab homes are clearly visible. Subsequently, Sela spotted traces and remnants of a genuine Palestinian visual archive occasionally cropping up in Israeli archives. Those traces were not immediately apparent, more like an elusive treasure concealed here and there beneath layers of restrictions, erasures and revisions. Thus, one day she noticed in the archive of the pre-state Haganah militia, stills bearing the stamp “Photo Rissas.” Digging deeper, she discovered the story of Chalil Rissas (Khalil Rassass, 1926-1974), one of the fathers of Palestinian photojournalism. He’s unknown to the general public, whether Palestinian or Israel, but according to Sela, he was a “daring, groundbreaking photographer” who, motivated by a sense of national consciousness, documented the pre-1948 Palestinian struggle. 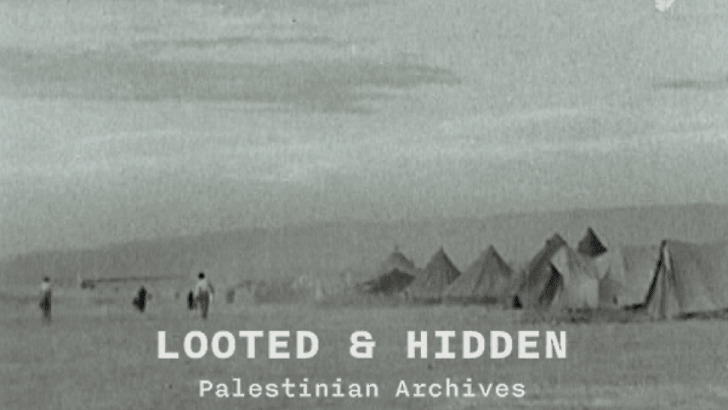 Subsequently she found hundreds of his photographs, accompanied by captions written by soldiers or Israeli archive staff who had tried to foist a Zionist narrative on them and disconnect them from their original context. The source of the photographs was a Jewish youth who received them from his father, an IDF officer who brought them back with him from the War of Independence as booty. The discovery was unprecedented. In contrast to the Zionist propaganda images that exalted the heroism of the Jewish troops and barely referred to the Palestinians, Rissas’ photographs were mainly of Palestinian fighters. Embodying a proud Palestinian stance, they focused on the national and military struggle and its outcome, including the Palestinians’ military training and deployment for battle. Sela thereupon decided to study the subject herself. In 1999, she tracked down Rissas’ brother, Wahib, who was working as a photographer of tourists on the Temple Mount / Haram a-Sharif in Jerusalem’s Old City. He told her the story of Chalil’s life. It turned out that he had accompanied Palestinian troops and leaders, visually documenting the battles fought by residents of the Jerusalem area during the 1948 War of Independence. “He was a young man who chose the camera as an instrument for changing people’s consciousness,” Sela says. Around 2007, she discovered the archive of another forgotten Palestinian photographer, Ali Za’arur (1900-1972), from Azzariyeh, a village east of Jerusalem. About 400 of his photos were preserved in four albums. They also depicted scenes from the 1948 war, in which Za’arur accompanied the forces of Jordan’s Arab Legion and documented the battle for the Old City of Jerusalem. He photographed the dead, the ruins, the captives, the refugees and the events of the cease-fire. In the Six-Day War of 1967, Za’arur fled from his home for a short time. When he returned, he discovered that the photo albums had disappeared. A relative, it emerged, had given them to Jerusalem Mayor Teddy Kollek as a gift. Afterward, the Jerusalem Foundation donated them to the IDF Archive. In 2008, in an unprecedented act, the archive returned the albums to Za’arur’s family. The reason, Sela surmises, is that the albums were captured by the army in battle. In any event, this was, as far as is known, a unique case. That work was three-pronged: doing archival research to locate Palestinian photographs and films that had been incorporated into Israeli archives; holding meetings with the Palestinian photographers themselves, or members of their families; and tracking down Israeli soldiers who had taken part in “seizing these visual spoils” and in bringing them to Israel. In the course of her research Sela met some fascinating individuals, among them Khadijeh Habashneh, a Jordan-based Palestinian filmmaker who headed the archive and cinematheque of the Palestinian Cinema Institute. That institution, which existed from the end of the 1960s until the early ‘80s, initially in Jordan and afterward in Lebanon, was founded by three pioneering Palestinian filmmakers – Sulafa Jadallah, Hani Jawhariyyeh and Mustafa Abu Ali (Habashneh’s husband) – who sought to document their people’s way of life and national struggle. Following the events of Black September in 1970, when the Jordanian army and the Palestine Liberation Organization fought a bloody internecine war, the filmmakers moved to Lebanon and reestablished the PCI in Beirut. The archive established by Habashneh contained forgotten works that documented the Palestinians’ suffering in refugee camps, the resistance to Israel and battles against the IDF, as well as everyday life. The archive contained the films and the raw materials of the PCI filmmakers, but also collected other early Palestinian films, from both before and after 1948. This activity reflects “a spirit of liberation and revolt and the days of the revolution,” Habashneh says in Sela’s film, referring to the early years of the Palestinian national movement. That spirit was captured in underground photographs and with a minimal budget, on film that was developed in people’s kitchens, screened in tents in refugee camps and distributed abroad. Women, children, fighters, intellectuals and cultural figures, and events of historic importance were documented, Habashneh related. “As far as is known, this was the first official Palestinian visual archive,” Sela notes. In her conversation with Sela, Habashneh nostalgically recalled other, better times, when the Palestinian films were screened in a Beirut cinematheque, alongside other works with a “revolutionary spirit,” from Cuba, Chile, Vietnam and elsewhere. “We were in contact with filmmakers from other countries, who saw the camera as an instrument in the hands of the revolution and the people’s struggle,” she recalled. What Habashneh wasn’t able to accomplish beginning in 1982 as part of a worldwide quest, Sela managed to do over the course of a few years of research in Israel. She began by locating a former IDF soldier who told her about the day on which several trucks arrived at the building in Beirut that housed a number of Palestinian archives and began to empty it out. That testimony, supported by a photograph, was crucial for Sela, as it corroborated the rumors and stories about the Palestinian archives having been taken to Israel. The same soldier added that he had been gripped by fear when he saw, among the photos that were confiscated from the archive, some that documented Israeli soldiers in the territories. He himself appeared in one of them. “They marked us,” he said to Sela. Another former soldier told Sela about an unusual photo album that was taken (or looted, depending on one’s point of view) from the home of the prominent Nashashibi family in Jerusalem, in 1948. The soldier added that his father, who had served as an IDF officer in the War of Independence, entered a photography studio and made off with its archive, while other soldiers were busy looting pianos and other expensive objects from the Nashashibis. Another ex-soldier testified to having taken a photo from the corpse of an Arab. Over time, all these images found their way to archives in Israel, in particular the IDF Archive. In 2000, Sela, buoyed by her early finds, requested permission from that archive to examine the visual materials that had been seized by the army in the 1980s. The initial response was denial: The material was not in Israel’s hands, she was told. A few more years of what Sela terms “endless nagging, conversations and correspondence” passed, which resulted in her being permitted to view dozens of segments of additional films, including some that apparently came from Habashneh’s archive. Sela also discovered another Palestinian archive that had been seized by the IDF. Established under the aegis of the PLO’s Cultural Arts Section, its director in the 1970s was the Lod-born painter and historian Ismail Shammout (1930-2006). Viewing it takes one back in time to the late 1960s and early ‘70s, when the cinema of the Palestinian struggle briefly connected with other international revolutionary film movements. Along with “The Urgent Call” – excerpts from which are included in her “Looted and Hidden” documentary – Sela also found another Shammout work in the IDF Archive. Titled “Memories and Fire,” it chronicles 20th-century Palestinian history, “from the days depicting the idyllic life in Palestine, via the documentation of refugeehood, to the documentation of the organizing and the resistance. To use the terms of the Palestinian cinema scholar and filmmaker George Khleifi, the aggressive fighter took the place of the ill-fated refugee,” she adds. The result is an intriguing paradox, such as one often finds by digging deep into an archive. The extensive information that Sela found in the IDF Archive makes it possible to reconstruct elements of the pre-1948 existence of the Palestinians and to help fill in the holes of the Palestinian narrative up until the 1980s. In other words, even if Israel’s intention was to hide these items and to control the Palestinians’ historical treasures, its actions actually abet the process of preservation, and will go on doing so in the future. Sela’s research on visual archival materials was preceded by another groundbreaking study – dealing with the written word – conducted by Dr. Gish Amit, an expert on the cultural aspects of Zionism at Ben-Gurion University of the Negev. Amit chronicled the fate of Palestinian books and libraries that, like the photographs and films Sela found, ended up in Israeli archives – including in the National Library in Jerusalem. In his 2014 book, “Ex-Libris: Chronicles of Theft, Preservation, and Appropriating at the Jewish National Library” (Hebrew), Amit trenchantly analyzes the foredoomed failure of any attempt to conceal and control the history of others. According to him, “an archive remembers its forgettings and erasures,” “documents injustice, and thus makes it possible to trace its paths” and “paves a way for forgotten histories which may, one day, convict the owners” of the documents. According to the National Library, it is holding about 6,500 Palestinian books and manuscripts, which were taken from private homes whose owners left in 1948. The entire collection is cataloged and accessible to the general public, but is held under the responsibility of the Custodian of Absentees’ Property in the Finance Ministry. Accordingly, there is no intention, in the near future, of trying to locate the owners and returning the items. At this point, Sela resorts to a charged comparison, to illustrate how visual materials contribute to the creation of personal and collective identity. “As the daughter of Holocaust survivors,” she says, “I grew up in a home without photographic historical memory. Nothing. My history starts only with the meeting of my parents, in 1953. It’s only from then that we have photos. Before that – nothing. Sela admits that there is still much to be done, but as far as she’s concerned, once a crack appeared in the wall, there was no turning back. “There is a great deal of material, including hundreds of films, that I haven’t yet got to,” she notes. “This is an amazing treasure, which contains information about the cultural, educational, rural and urban life of the Palestinian people throughout the 20th century – an erased narrative that needs to be restored to the history books,” she adds. A spokesperson for the Defense Ministry, which was asked to comment on the holdings in the IDF Archive, the archive contains 642 “war booty films,” most of which deal with refugees and were produced by the UNRWA (the United Nations refugee relief agency) in the 1960s and 1970s. The ministry also noted that 158 films that were seized by the IDF in the 1982 Lebanon War are listed in orderly fashion in the reading-room catalog and are available for perusal by the general public, including Arab citizens and Palestinians. As for the Palestinian photographs that were confiscated, the Defense Ministry stated that there is no orderly record of them. There are 127 files of photographs and negatives in the archive, each of which contains dozens of photographs, probably taken between the 1960s and the 1980s, on a variety of subjects, including visits of foreign delegations to PLO personnel, tours of PLO delegations abroad, Palestinian art and heritage, art objects, traditional attire and Palestinian folklore, factories and workshops, demonstrations, mass parades and rallies held by the PLO, portraits of Arab personalities and PLO symbols. The statement adds that a few months ago, crates were located that were stamped by their original owners, “PLO/Department of Information and National Guidance and Department of Information and Culture,” during the evacuation of the archive’s storerooms in the Tzrifin base.